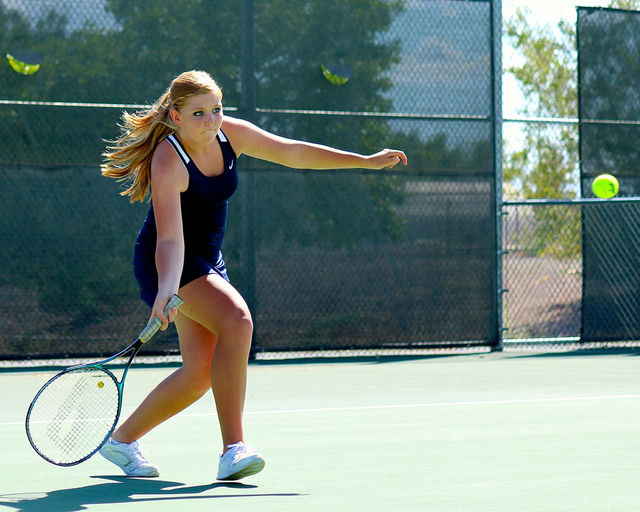 Melissa O’Berto, Arianne Hess and Natalia Fullmer each went 3-0 in singles to lead Boulder City’s girls tennis team to a 15-3 victory over visiting Sunrise Mountain in a league match Sept. 17. The Lady Eagles, 6-1 overall and 5-0 in the Sunrise League, are trying to go undefeated in league play for a third straight year. Last year, they finished with a school record of 12-0 and reached the second round of the state playoffs. The doubles teams of Sariah Gneiting and Alexis LeMaster, Iris Meijer and Natalia Fullmer, and Kyra Yamamoto and McKenna Frazier were 3-0 each for Boulder City in the victory against Sunrise Mountain. Two days later against Desert Pines, the No. 1 doubles team of Gneiting and LeMaster went 2-0 to help the Eagles win 11-7. Hess was 2-1 in singles. Meanwhile, the boys team sports a 2-5 record and a 2-3 league record. On Friday, Andre Pappas was 3-0 in singles for Boulder City, but the Eagles dropped the match 9-8. They defeated Sunrise Mountain, 12-0, by forfeit on Sept. 17. Both Boulder City tennis teams are scheduled to play at 3 p.m. Monday at home against visiting Virgin Valley. They also travel to Quest Prep Wednesday for a 3 p.m. match. The boys and girls cross-country teams had the week off. Their next meet is at 8 a.m. Saturday in the Foothill Falcon Invitational. The girls had a league match Tuesday at the Boulder Municipal Golf Course. They have a match scheduled for 3 p.m. Monday against Desert Oasis at Boulder Creek Golf Course. They also have a Sunrise League seven-team match at 10 a.m. Wednesday at the National Golf Course. The Boulder City boys and girls teams are both concluding a week off and return to game action Monday against Moapa Valley. The Eagles are 0-3-0 overall and 0-3-0 in Sunrise League play are on the road in Overton. The Lady Eagles (0-3-1 and 0-2-1) will play Moapa Valley at home. On Tuesday they played Desert Pines.